Selected with the Club’s second pick at the 2017 NAB AFL Draft, 18-year-old Ed Richards fast became a fan favourite at VU Whitten Oval. 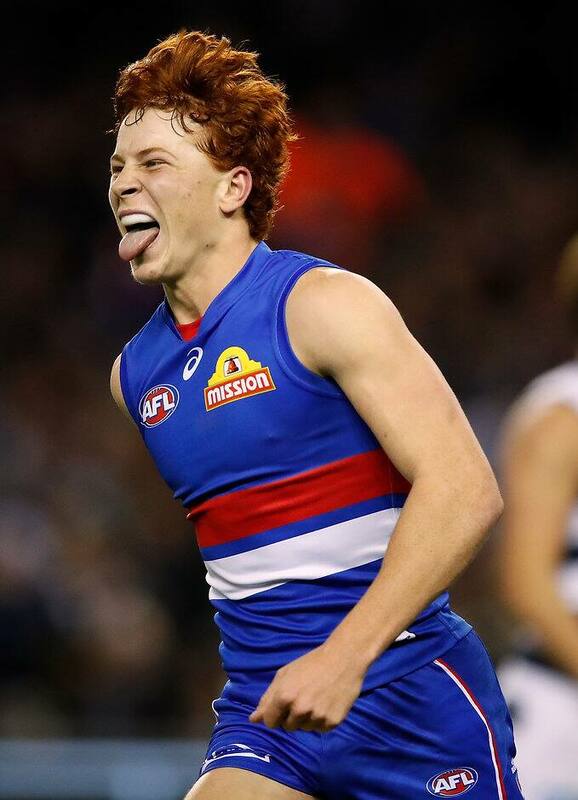 Debuting in the Dogs’ Round Two clash against West Coast, Richards looked like he belonged from his first senior performance - gathering 11 disposals and six marks against the Eagles - ultimately securing his spot in the best 22 for the remainder of the season. Similar to Naughton, Richards showed his versatility with a move to the forward line in Round 13, where he slammed on three third quarter goals in a loss to Port Adelaide. From then on, Richards continued to shine in multiple roles – earning him a NAB Rising Star nomination for his Round 10 performance against Collingwood, where he gathered a career-high 23 disposals (10 contested), eight intercept possessions and five inside 50s. Richards put pen to paper on a contract extension earlier this season, keeping him at the Club until at least the end of the 2021 season. Making his AFL debut in a thrilling win over Geelong during Round 15, then 20-year-old Brad Lynch enjoyed a solid performance on the Etihad Stadium turf, collecting 18 disposals, three marks and two tackles. Playing every game for the remainder of the season, the Mandurah-bred speedster submitted a number of encouraging performances, including his outstanding Round 16 showing against Hawthorn where he gathered 23 disposals and five marks – all in his second senior appearance. If Dogs fans weren’t already excited over Lynch’s performance, one quirky stat got them buzzing. Of all the Brownlow Medal winners this century, only Richmond’s Dustin Martin managed to gather more disposals in his first three AFL games than Brad Lynch, who gathered 57 disposals in Round’s 15-17. After showing strong form in the VFL, 20-year-old Fergus Greene earned his first AFL opportunity on Ballarat’s Mars Stadium against Port Adelaide in Round 19. Settling the nerves with a second quarter goal, Greene looked comfortable in the forward line – laying five tackles and collecting two marks against the dominant Power. Booting a goal in all five senior appearances, the developing forward enjoyed a promising performance in his second game, collecting 14 disposals, four tackles and six marks in the side’s 25-point victory over St Kilda. Showing his potential in the latter half of the season, Greene was rewarded with a contract extension – keeping him at the Club until at least the end of the 2019 season.